Yesterday we visited Mercardo de la Merced, the city’s original wholesale market and now the biggest retail market in Mexico City. The market has seven official buildings and many adjacent makeshift buildings. Each of the seven official buildings specializes in a different product category: party supplies, restaurant equipment, neon lights, electronics, shoes, clothing, and, of course, food. We spent hours wandering through the various food sections and stopped to snack on pozole and quesadillas con flor de calabaza (quesadillas filled with squash blossoms). 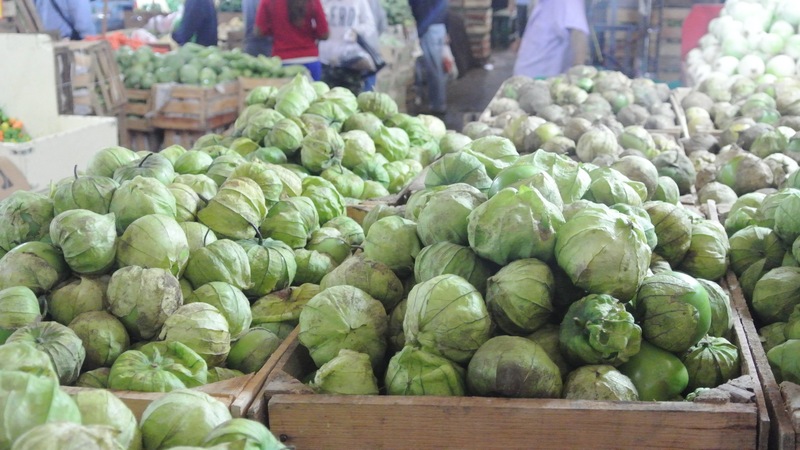 Here are some photos from Mercado de la Merced. Disfrutenlos! One of the many lunch nooks. Some of the popular items include soups like pancita (a brothy, spicy beef soup with tripe), quesadillas, tortas (pressed sandwiches), and tacos (claro!). 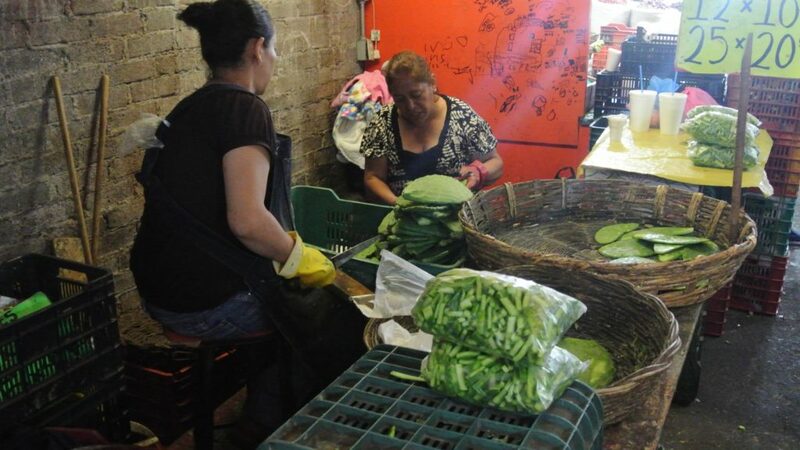 Here are two women cleaning nopales, the leaf of the cactus plant. Vendors clean the spikes off the pads and often pre-slice them into handy, ready-to-cook strips. These bright green leaves are ubiquitous in Mexico and have a subtle, slightly acidic flavor and a mucilaginous texture similar to okra. 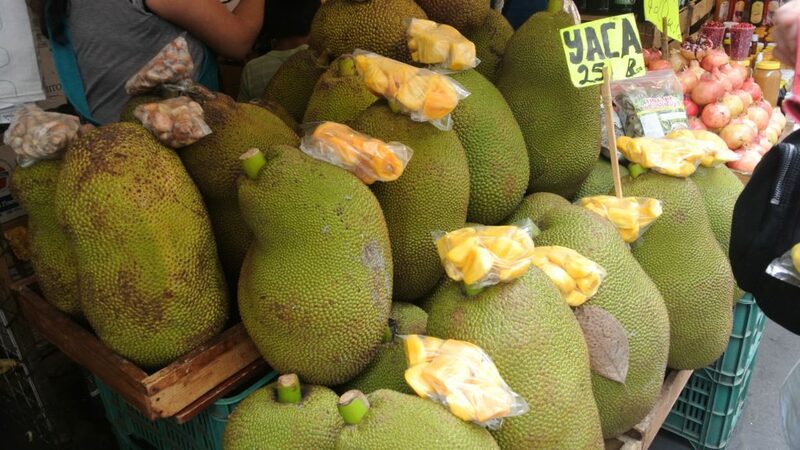 This is jackfruit, which is a somewhat polarizing fruit grown in the tropics. When opened, the fruit has a very strong smell which is not pleasing to all. The flesh is sweet, but with a mildly funky undertone – I think it tastes like a cross between a mango and a durian. One of our snack stops. Here we had a quesadilla de flor de calabaza, or squash blossom quesadilla. This lady clearly knew what she was doing! From this tiny kitchen she was serving a dozen customers, working her comal, or flattop, like a pro. Not only was she making tortillas and quesadillas to order, but she was also scorching tomatoes and jalapeños in preparation for a new batch of salsa. Like most Mexican cooks, she blends her salsas by hand in her molcajete, which is the traditional Mexican mortar and pestal that you see in the left of the photo. And finally, this…what do you think it is? Your guess is as good as ours.